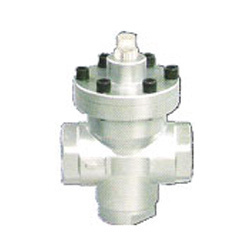 Pioneers in the industry, we offer flow control valves from India. We offer our customers a wide range of high quality; performance oriented Control Valves, which includes various types of Pilot Operated Control Valves and Quick Exhaust Valves. The various Pilot Operated Control Valves offered by us are known for their reliable, rugged and fast response. The high flow, 2 position, spring return, directional control valves are provided with built in spare parts. These are available in various designs and specifications for providing pneumatic control system; and are made with aluminium body with reversible poppet seal. The versatile range of Quick Exhaust Valves offered by us has been specially designed to unload the system quickly and promptly. These are widely used in various pneumatic systems for increasing the speed by offering immediate outlet to atmosphere of the air exhausted from the cylinder. Further, these valves also find application in screw compressor systems for unloading the system. A muffler is fixed in the outlet port for reducing the noise. Low operating differential is achieved owing to the synthetic rubber diaphragms that are also ensures no friction common to valves using pistons. Port Size: 1/2", 1" , 1 1/2", 2"
Operating Temp: (Nitrile Seal) 0-80 Deg. C and (Vilion) 0-250 Deg. C.